Last week, I sent out a request for my newsletter subscribers to send in their best [tag]drills[/tag] for [tag]how to shoot better in basketball[/tag]. 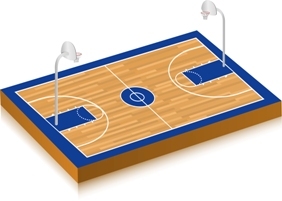 Check out this [tag]basketball[/tag] [tag]drill[/tag] below (very creative!). 3-4 player drill and 2 balls, one player [tag]shooting[/tag] [tag]lay-ups[/tag], one [tag]rebounding[/tag] and the other 1 or 2 receiving an outlet pass from the rebounder. Each time the player receives that outlet pass they return the ball to the top of the key near the foul line for the [tag]shooter[/tag] to retrieve for the next lay-up. The drill is a good [tag]conditioning[/tag] drill, the rebounder practices rebounding and looking for the outlet. Coaches should expect good, crisp passes to the outlet. The shooter is practicing lay-ups at a quick pace alternating from the right to the left. After the shooter makes 10 lay-ups the players alternate.